Boyracers… | Scots Whay Hae! This month’s Indelible Ink column, now available over at dearscotland., is concerned with Alan Bissett’s debut novel Boyracers. Set in and around Falkirk at the turn of the last century it concentrates on the lives, likes and dislikes of four pals who are enjoying the last days of being together before post school life begins to tear them apart. This is a book stuffed with cultural references and discussions. 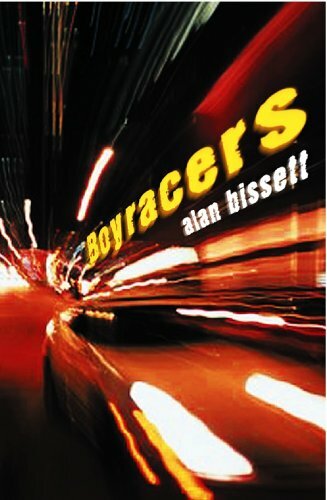 Normally when this is the case you can get the feeling that the author is attempting to show their cool credentials (hello to Alan Warner), but in Boyracers Bissett uses the banter that flows between the boys to say so much more. Discussion on music or film are laced with subtext as to the unspoken grievances and hierarchy that exists within the group. Bisset has a great ear for language, but he also understands how it is used. Boyracers is a great first novel but, with his second The Incredible Adam Spark and last year’s Death of a Ladies’ Man (soon to be reviewed on these pages) he has shown himself to be one of Scotland’s best writers. Next month’s column will look at a writer who has become a particular favourite of mine, and what is perhaps his best novel. It’s Iain Banks’ controversial debut The Wasp Factory When it was published in 1984 it seemed to horrify and delight in equal measure. What is certain is that this novel provokes strong reactions. Many of the themes that regular readers of Banks would come to expect appear in The Wasp Factory. Family, gender, religion, questions of nature versus nurture and the evil that (mostly men) do are all examined with the blackest of humour. It’s a hell of a calling card but I would argue that Banks, who is one of the most prolific writers in Scotland, has lived up to the promise it showed.